A horizontal stuffer is a great addition to any meat processing setup. We offer a water powered stuffer proudly made in the USA. This horizontal stuffer is easy to use and clean. Making sausage can't be more simple with this item from One Stop Jerky Shop. 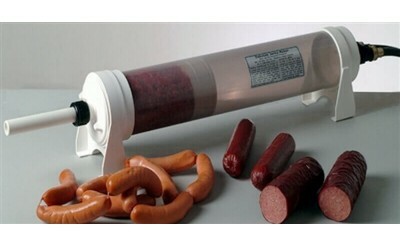 The Dakotah Water Powered Sausage Stuffers translucent body shows you exactly how much sausage meat is in the stuffer cylinder at all times. Visibility eliminates the guess work and enhances the overall performance of a great sausage stuffer. The water powered sausage stuffer operates on minimal wat..